US-based extrusion machinery maker Davis-Standard is launching its new dsX flex-pack extrusion coating line at Chinaplas. The line is said to provide converters and package printers with a competitively-priced system "that will give them distinct advantages when seeking to expand sales in the price-sensitive global flexible packaging market," says the firm. This pre-engineered line can also be delivered quickly - in as little as six months -- and provides customers with all the capabilities and flexibility needed to ramp up and compete effectively for a variety of rapidly emerging application opportunities including salted snack and noodle bags, toothpaste tubes, sachet packs, personal care products, condiment packs and stand-up pouches. 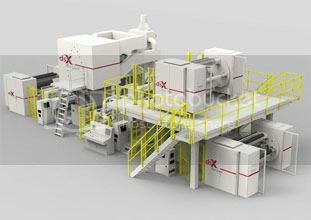 Bob Florence, Executive Vice President Sales and Marketing of Davis-Standard said, "All of the components of the dsX flex-pack extrusion coating line are based on our proven, feature-rich designs and technology that minimise technical risks and lower cost of ownership. We have included everything our customers will need to achieve their flexible packaging manufacturing objectives, whether they are converters looking to upgrade for higher throughputs and quality; multinational suppliers in search of expansion opportunities; high-quality printers who want to enhance their lamination processes; or start-ups who could benefit from partnering with a company that can lead them through all the steps that assure extrusion coating success." The flexible packaging line includes an unwinder; corona treaters; extrusion laminator; gravure primer coater dryer; pull roll with nip; winder; electrically heated, air-cooled Davis-Standard extruder with advanced feedscrew design; downstream, carriage, and controls (Seimens drives and controls used throughout). Lines are available in two versions to accommodate almost any plant: one is a longer line with the auxiliary unwinder placed close to the floor; the other raises the auxiliary unwinder to a position just atop the winder to shorten both the line length and the path of the auxiliary web to the laminator. Advanced computer technology that is standard on the dsX flex-pack includes DS APC (automatic profile control), which continually adjusts the product profile for best performance, and a DS5 computer, which allows for remote access to the line for troubleshooting and updating over a secure internet connection. Performance data is exportable to factory systems for SPC and other analytical management tools. The firm says the line represents the first of many new innovations expected to be introduced within the next year. "The goal is to help customers be more competitive by optimising their ability to respond to market and its ever-changing needs," it says.